SAMBALPUR: The neurosurgery department of VSS Medical College and Hospital, Burla, is functioning with half its doctor strength. It has only one professor, who is also the head of department and an assistant professor. The post of senior resident is vacant as the appointee is yet to join and the associate professor is on deputation to SCB Medical College and Hospital, Cuttack. “Accident victims with head injuries are brought to the neuro-surgery department. The staff shortage has proved to be a big problem,” said social worker Nihal Singh. He said the government should immediately fill up the vacancies. Head of neurosurgery department Dr S K Mishra said the hospital tries to attend to all patients. “The pressure on doctors would have minimized if there were new recruits,” Mishra said. Dr S S Pradhan, who was appointed as senior resident of the department, is unable to join because the labour department has not relieved him from his post of medical officer in-charge of ESI dispensary in Puri. “The department screening committee disallowed him to join the post of senior resident on administrative grounds,” stated a letter of labour and ESI department. To revamp the healthcare system in India, the central government is upgrading the existing state government medical colleges to AIIMS level institutions under PMSSY. This is a positive step. Established in 1959, the VSS medical college and hospital, Burla offers undergraduate and postgraduate education in medicine, surgery, pharmacy and nursing. People of western Odisha (viz. Sambalpur, Balangir, Bargarh, Boudh, Subarnapur, Deogarh, Kalahandi, Sundargarh, Jharsuguda, Nuapada districts and Athamallik subdivision) along with several districts of Chhattisgarh and Jharkhand states are heavily dependent on VSS medical college and hospital at Burla for tertiary health care. However, the available medical facilities and existing infrastructure in this state government medical college is inadequate to handle the needs of this populous. 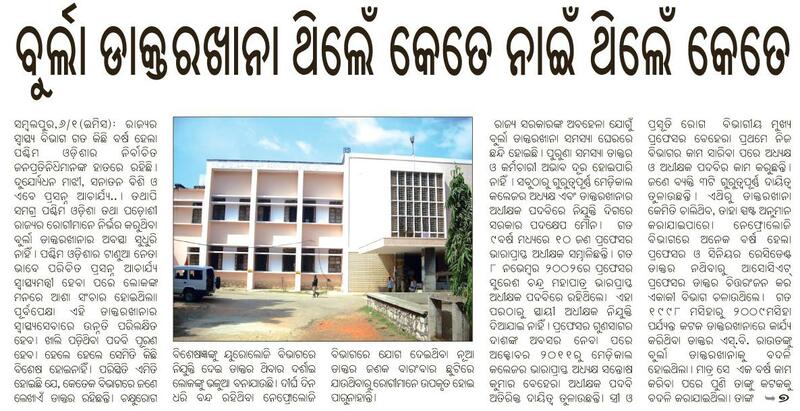 The health facility in western Odisha is one of the worst in the nation. Not only there is a serious shortage of health professionals but also the infrastructures in hospitals of this region are insufficient and under equipped. 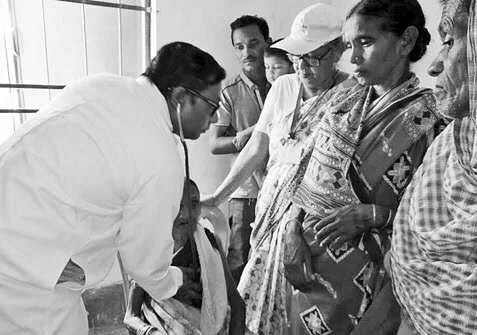 Hundreds of lives are lost every year in Kalahandi-Balangir-Koraput (KBK) and western Odisha from common disease like diarrhea and poor health facilities. 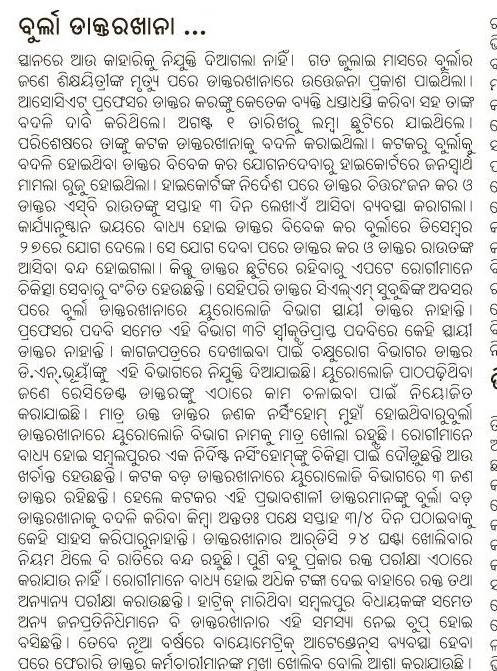 The dignitaries of both ruling party and opposition parties (including Shri Rahul Gandhi and Shri LK Advani) are well aware of this as they have visited KBK and western Odisha several times in the recent past. 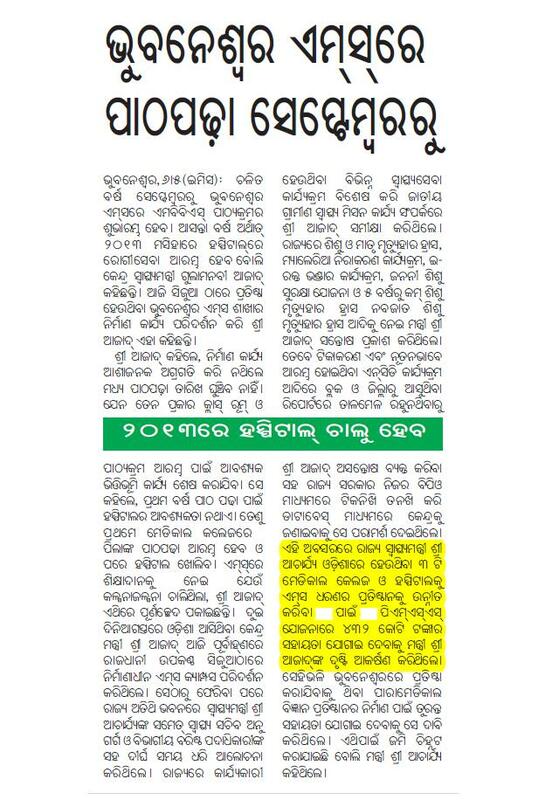 Despite their promises there is no improvement in the existing health care facilities in western Odisha. It is reported that Bihar has succeeded to get two of its medical colleges selected to be upgraded in addition to the new AIIMS in Patna. Furthermore, there are reports that various state goverment medical colleges in the country will be upgraded to AIIMS level. Along this line, earlier we have requested both the Odisha and central government to upgrade the VSS medical college, Burla to an AIIMS level institution. Keeping this in mind, during a recent visit the health minister of Odisha Shri Prasanna Acharya has requested Shri Ghulam Nabi Azad, to upgrade the VSS medical college, Burla to AIIMs level. We strongly support the demand of Shri Acharya and the Odisha govt. Upgradation of VSS medical college and hospital, Burla to an AIIMS level institituion under PMSSY will create better medical facilities for the people of western Odisha, Chatisgarh and Jharkhand. Furthermore, it will boost the higher education in this most backward region of India. Therefore, we request you to kindly initiate necessary process for the up-gradation of VSS medical college and hospital, Burla to an AIIMS level institution under PMSSY. Click here to download the complete memorandum. BHUBANESWAR: The draft plan for transforming VSS Medical College and Hospital,Burla, into a unitary university through an actof the state assembly is almost final. Once it is implemented, the institute will enjoy administrative, academic and financial autonomy like the Sanjay Gandhi Post Graduate Institute of Medical Sciences (SGPGI), Lucknow. The health and law departments are jointly working on the draft plan for Veer Surendra Sai Institute of Medical Sciences. “The plan to develop the college on the lines of SGPGI is in its final stage,” director medical education and training (DMET) Dr P K Das told TOI. Once ready, the draft bill will be placed before the Cabinet and then before the assembly. The government is keen on bringing the Bill in the coming session itself, government sources said. As per the draft, a governing body under the presidentship of the chief secretary will be the apex decision making body of the proposed VSSIMS. Other ex-officio members of the governing body would include secretaries of health and family welfare and finance departments, the institute director and the DMET. The local MP, two MLAs, seven persons of eminence having special knowledge in technical education, principals of two other medical colleges and two medical teachers would be nominated members of the governing body. The draft proposes that the institute director would be the chief administrative authority of the institute and chairman of its academic board. The board will be responsible to ensure standard of education and research in the university. Established in 1959, the 850-bed state-owned medical college offers undergraduate and postgraduate education in medicine and surgery, besides pharmacy and nursing courses. It has 22 clinical departments and caters to 12 districts of western Orissa, four districts of Chhattisgarhand two districts of Jharkhand for tertiary patient care. The government intends to increase the undergraduate seats of the college from 150 to 250 soon.